Densberg is located in the southern part of the National Park Kellerwald-Edersee. This cosy and accessible holiday home with terrace and garden is situated at the outskirts of the idyllic and small village. 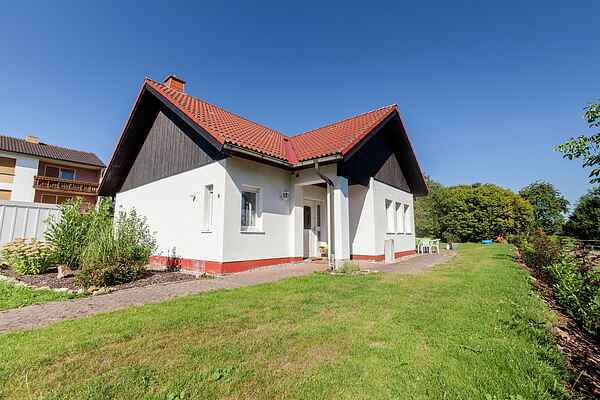 The detached and bright house offers sufficient space and is completely equipped. From here, numerous hiking paths stretching for miles across the Kellerwald run across the attractive region. A supermarket, a beverages market and an open-air swimming pool are located only 2.49 miles from the house. In approximately 15 minutes, you can reach the Borkener Seenplatte, where you can swim or windsurf. The Edersee as well as the historic centre of Fritzlar (24.23 miles), Bad Wildungen (15.53 miles), Marburg and Kassel (31.07 miles) can be easily reached by car. The surroundings provide a comprehensive range of sports and leisure activities: fishing, fitness, water world, ninepins, mountain biking, Nordic walking, biking, riding, tobogganing, skiing, sauna, ice skating, swimming, shopping, summer toboggan run, tennis, hiking.